Research indicates that consuming wild blueberry juice lowers systolic blood pressure in people at risk of type 2 diabetes. Improving the heart health of type 2 diabetic patients is of great clinical significance, as it has the potential to lower the mortality rates. Type 2 diabetes is a major risk factor for heart attack. It is often the result of an unhealthy lifestyle, lack of physical activities, obesity and aging. Adopting an active life style along with a plant based diet may decrease the risk of type 2 diabetes. Various compounds, including polyphenols found in plants, confer health benefits. Blueberries are one of the richest sources of polyphenols and other beneficial compounds such as flavonols. Some clinical trials have reported that consumption of blueberries improves insulin sensitivity and biomarkers of cardiovascular disease such as blood pressure, oxidative stress and endothelial function. However, studies have indicated that high consumption of some of the compounds, such as anthocyanins, may have the inverse effect on patients with type 2 diabetes. Thus, clinical trials to determine standard doses of fruit juice are needed so this readily available treatment can be used to improve risk factors for chronic diseases like diabetes. A single blinded study on Canadian men and women 22 to 65 years of age from March to May 2014 assessed the effects of short term consumption of 100% wild blueberry juice on risk factors of type 2 diabetes. The risk factors included a BMI >= 25 Kg/m2, waist circumference >88 cm for females and >102 cm for males, family history of diabetes or gestational diabetes, and belonging to a high risk population for type 2 diabetes. Participants who had a low BMP, were pregnant and lactating, had type 1 or 2 diabetes, consumed drugs or alcohol, and exercised heavily or were losing weight were excluded. Subjects were instructed to consume 240 mL of 100% wild blueberry juice or placebo each while maintaining their normal diet. 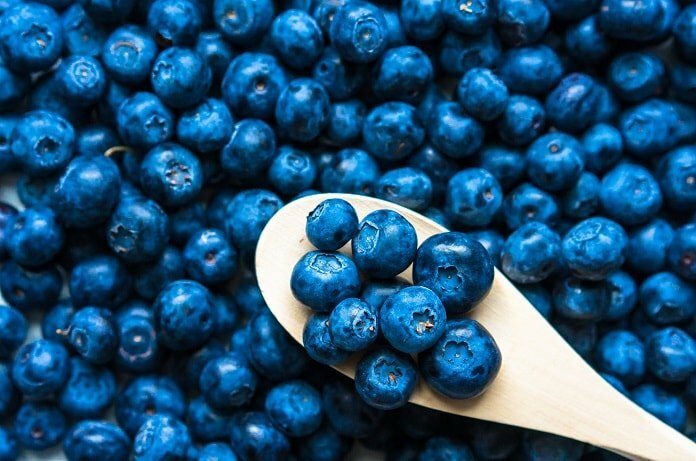 The blueberries were harvested on Edward Island, Canada and the juice was prepared at the University of Prince Edward Island Human Nutrition Research Center. The placebo and blueberry juice differed only in the polyphenol levels; placebo did not contain any polyphenols. Blood pressure, endothelial functions, body weight/composition and cholesterol levels were measured at the beginning and the end of each weekly treatment period. No change in the total carbohydrates, proteins, cholesterol, fiber intake or the body weight was observed throughout the study period. Likewise, endothelial functions, glucose regulation and triglyceride concentration were the same both groups. However, systolic blood pressure decreased on average by 4% in the treatment group compared to placebo. In the participants with pre or stage 1 hypertension, the effect of consuming 100% wild blueberry juice was even greater with a reduction of 6%. Decreased systolic blood pressure has high clinical significance as reductions of only 3 mmHg can reduce mortality by 5 to 8 %. Nitric oxide concentration was also found to be higher in concentration in participants who consumed blueberry juice compared to placebo. This may be due to polyphenol metabolites of blueberry juice inhibiting the NAPDH oxidase and increasing the amount of nitric oxide in the blood. Other clinical studies assessing the effect of blueberry compounds in human health were done with freeze dried blueberry powder. The majority of studies agree that blueberry consumption, in various forms, lowers systolic blood pressure, however, results regarding other risk factors like insulin sensitivity are conflicting.